The paths of the stars. I've been making images of Green Men and tree people for as long as I can remember, at least since I first read J. R. Tolkien's descriptions of Fangorn forest and it's tree shepherds. 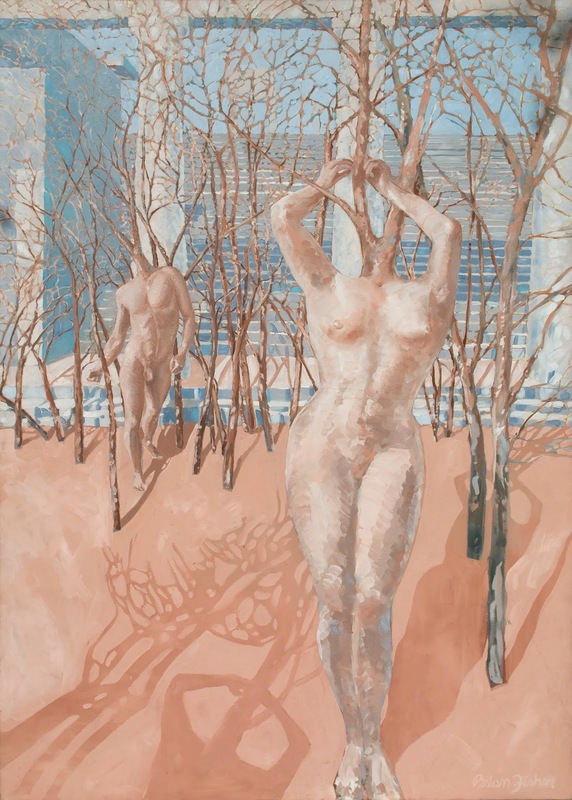 This painting, The Pull of the Earth is from a series that explored relationship, desire and the mysterious force that is physical attraction. If every object that has mass produces gravitational force relative to how much mass it has, is there a similar explanation for the overwhelming emotional and physical pull of one for another? My Green Man Albus Darach is a more traditional representation of the Green Man, or "foliate head” of the British Isles. 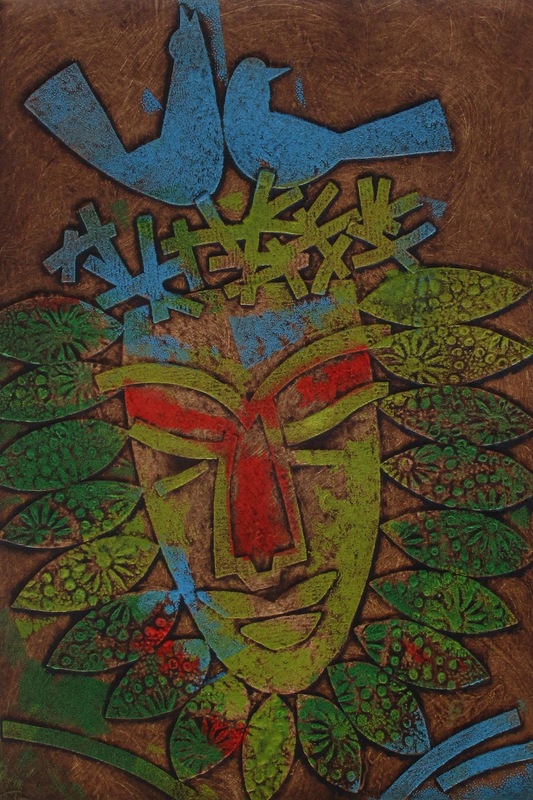 You may find Albus Darach in my Studio, no.16 with his Green Man collograph print siblings, during the Vashon Island Art Studio Tour, May 6-7 & 13-14, 2017. Darach is Gaelic for "Oak tree.” Around him you can see the leaves and acorns of the tree and rectangular portals representing passage, change or transformation. The Oak is almost synonymous with strength, steadfastness and historically is associated with the sacred groves and forests of of the Druids. The Roman Gaius Plinius Caecilius Secundus lived in Gaul during the 1st century CE and wrote that Druid priests performed all their religious rites in Oak groves, where they gathered mistletoe from the trees with a golden sickle. Dense forests of Oak covered most of Northern Europe at that time and the tree's human-like attributes of trunk/body, branches/arms, twigs/fingers, and sap/blood may explain what made them sacred and subjects of worship to the Gaelic people. When Christianity eventually came to Ireland, Scotland and England, Christian churches were often built in Oak groves, probably because they were already recognized as places of worship. An example is Kildare, where St. Brigid founded her abbey. Kildare derives from “Cill-dara”, the Church of the Oak. This association of place between old and new religions may also explain the carved decorative and enduring interpretations of pagan nature spirits within sacred Christian spaces through time. These images are now recognized as the Green Man. 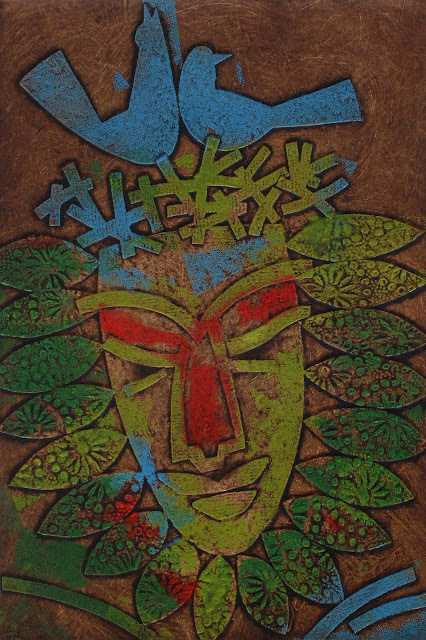 Katsura is my Green Man collograph named for the beautiful Katsura tree, native to China and Japan. Please visit Brian Fisher Studio and Katsura during the Vashon Island Art Studio Tour May 6,7-13-14. This Green Man is inspired by the mythic Japanese Kodama, spirit guardians and animated souls of the mountain forests of Japan. Kodama spirits are revered by Japanese as gods and protectors of trees. The Kodama bless the land around their forest with fertility. The villagers who find Kodama inhabited trees designate them with sacred rope known as a Shimenawa. Japan honors nature and these sacred Kodoma spirit trees are often found within the grounds of Shinto shrines and Buddhist temples. 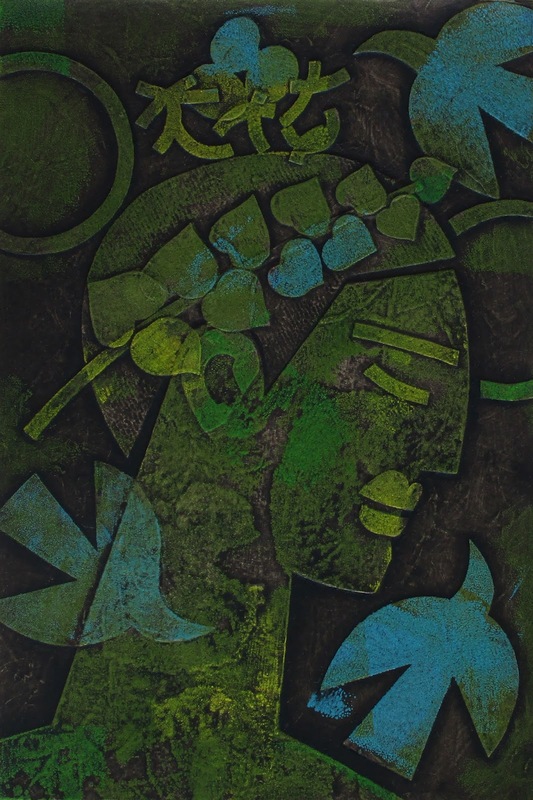 Baobab is Africa's tree and also what I have named my Green Man collograph. Baobab trees are indigenous to 31 African countries. Because the Baobab has a fibrous bark and has no tree rings, it’s not clear how long the tree lives, though experts say a Baobab may live for 500 years, others estimate as many as 2000! By any standard the Baobab is the living elder of plants on a continent which reveres elders. Many myths and legends are associated with the Baobab. Stories of the mischievous spirits that reside within them were collected by explorers of East and West Africa in the early twentieth century. In the Northern Cape Province of South Africa some people still believe wood spirits inhabit the flowers of the Baobab and it's said that those who pick them will be eaten by lions! In many African communities the tree is recognized as a deity who has decided to live among humans. Village life and it's rituals are celebrated beneath it. In Burkina Faso, a mourning drum rite, reserved for revered chiefs, is also celebrated upon the death of the Baobab tree. The Baobab is home to fruit bats, weaver birds, parakeets, lovebirds, to owls, hawks and predators of the bush who feed upon rodents that live among the Baobab's roots. The Baobab stores water, gallons and gallons of sustaining water, even in drought, one of the reasons it is known as "The Tree of Life". Its' leaves and flowers serve as salad for humans. Its edible seeds, when cooked, provide a substitute for coffee. The white pulp of the fruit can be boiled into a sherbet-like lemonade which is very high in vitamin C. The tree provides no timber, its wood is soft like balsa, but the bark serves as food for elephants in drought and can also be made into rope, roofing material, and clothing. This is my Green Man collograph, Bayani. Visit him during the Vashon Island Art Studio Tour, the first two weekends in May 6-7 & 13-14, 2017. 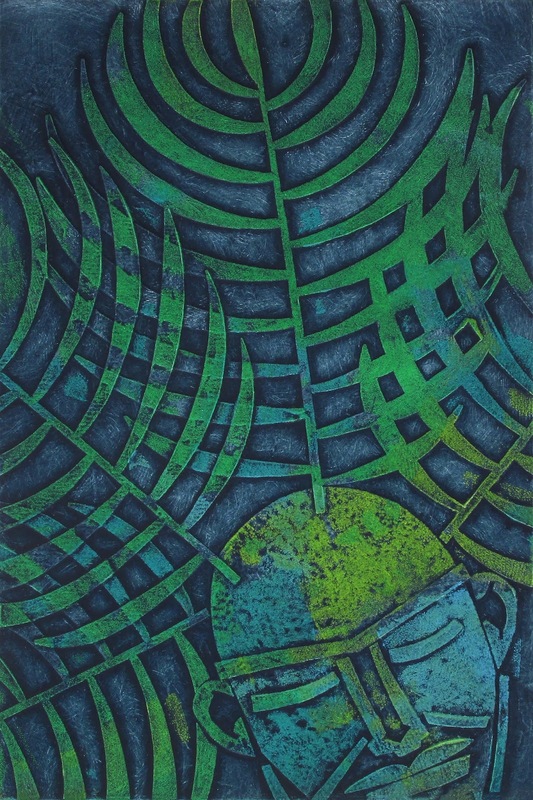 Banyani was inspired by a Philippine creation, vegetation/resurrection myth. This story is interesting because it involves a combination of three gods to bring mankind into this world. One, Bathala, (caretaker of the earth), battles, kills and burns the second, his challenger, Ululant Kaluluwa, (sky serpent, orphaned spirit), befriends and loves the third, Galang Kaluluwa, (winged, wandering spirit). Upon the peaceful death of and request by Galang Kaluluwa, Bathala buried Galang’s body where the serpent god Ululant Kaluluwa had once been killed and burned. From their common grave grew a tall tree with a large round nut, the coconut palm. Its’ leaves looked like the wings of Galang Kaluluwa, but the trunk was sinuous like the the serpent Ulilang Kaluluwa. When Bathala husked the nut he found what looked like two eyes, a nose, and a round mouth. This fruit from the vegetative union of two dead gods inspired him to create the first man and woman in the image of the coconut and then the first home for them from the trunk and leaves of the coconut palm. My collograph Banyani is a symbol of rebirth and the cycle of life. 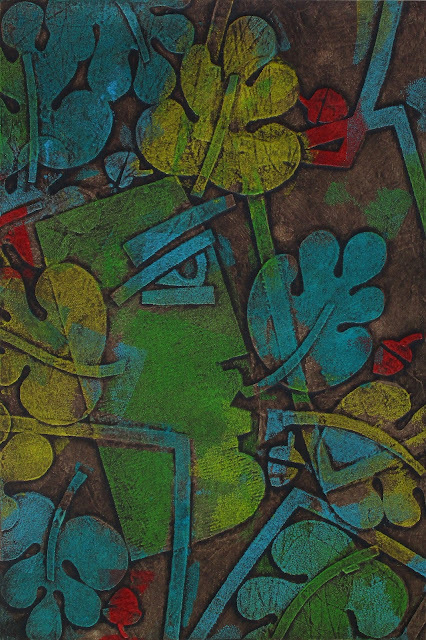 The mythic Green Man represents a union of humanity and the vegetative world. He is the sacrificial human conduit and connection to the plant cycle of birth, reproduction, revitalization and resurrection. Known by many names, through time and a spectrum of cultures, including but not limited to: Dionysos, Orpheus, Osiris, Adonis, Cernnunos, Khidir etc… he is the god born to sacrifice and through his union with the goddess to be born again. Historically, his seasonal incarnation was worshiped locally. My print Atticus (man of Attica) celebrates the area of Greece that includes the region centered on the Attic peninsula that projects into the Agean Sea, encompassing the city of Athens, capital of Greece. 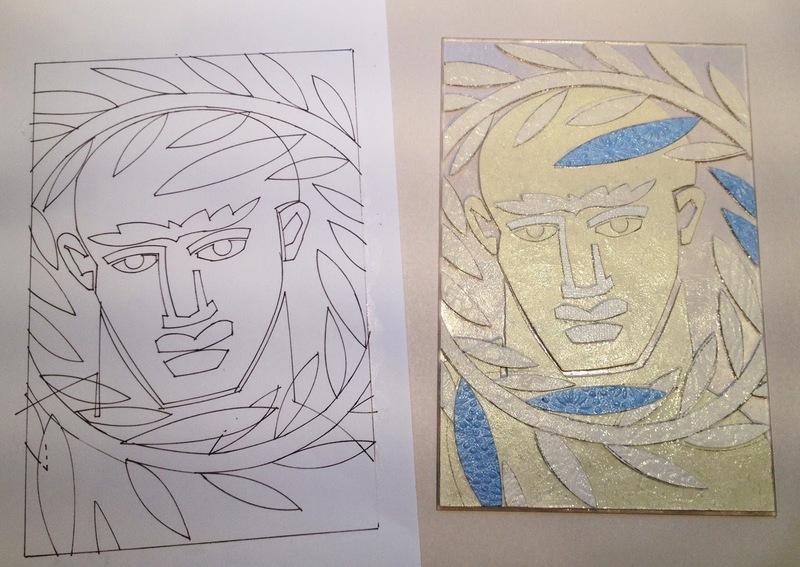 Atticus is the first of many Collograph images I have made to celebrate The Green Man. 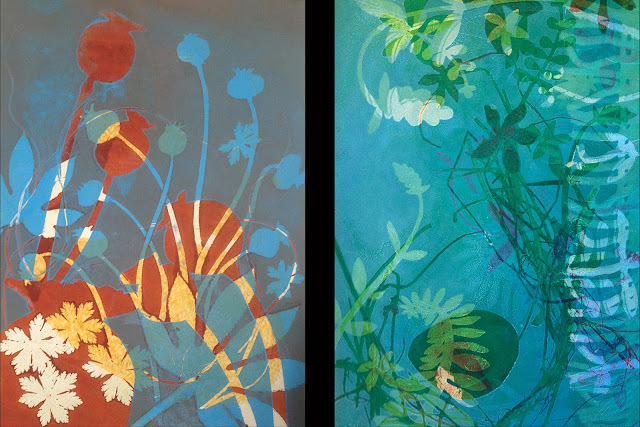 Artist Valerie Willson shared her approach to collograph in a couple wonderful workshops at Vashon's Quartermaster Press. We attached thin materials like paper and cloth to plexiglass plates with gloss acrylic medium and created texture with modeling paste. 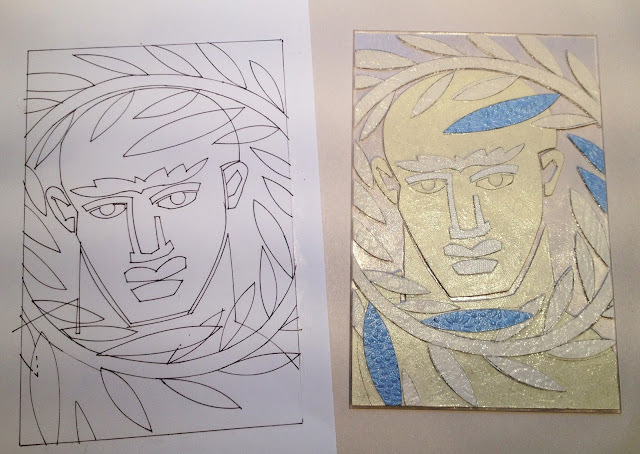 The result was a very sturdy collograph plate. 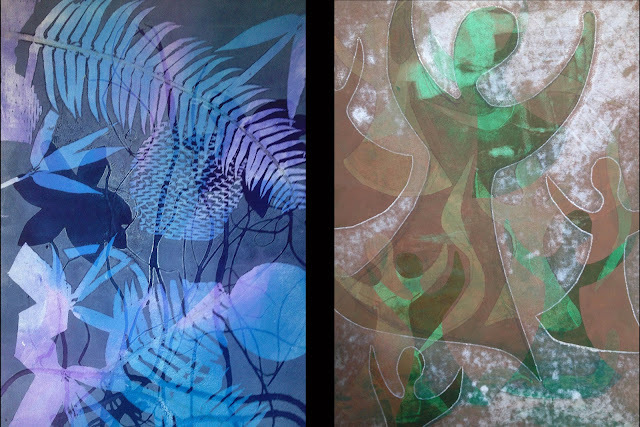 Inspired by what I learned, I've been exploring the process in a series of prints about myth in nature. 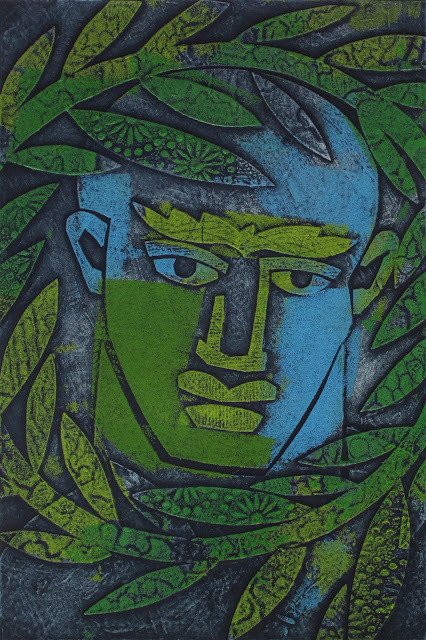 Here is a drawing and collograph plate of "Atticus," from my Green Man series. Collagraph, collograph, no matter how you spell it, refers to a collage of materials glued to a substrate to create a printable plate. 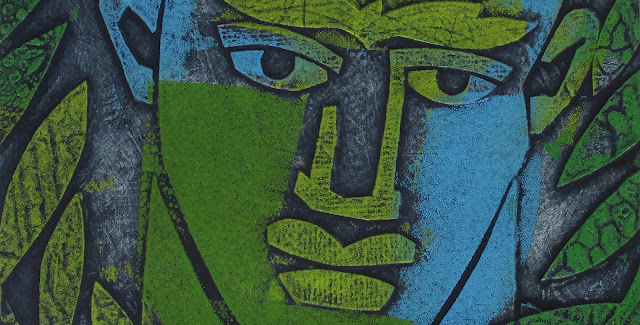 Ink may be applied to the high surfaces of the plate with a brayer, like a relief print, or ink may be applied to the entire plate and then removed by wiping from the upper surfaces leaving ink between and around collage elements, resulting in an intaglio print. I now employ both methods when making my own collographs. Below is a detail that illustrates both the relief and Intaglio approach to inking. Ilse Reimnitz and I teach a monotype workshop one or two times a year. It is always fun to share this print process with others and spend creative time with Ilse. Above and below are a few examples from our April 2017 workshop. Each was made using oil base etching inks over a smooth plexiglass plate and printed in layers with a Takach etching press.